Congratulations! 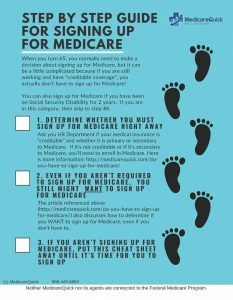 You’ve signed up for Medicare! You’ve successfully managed the http://Medicare.gov or http://SocialSecurity.gov website (or perhaps you signed up a more old fashioned way) and received your Red White and Blue Medicare Card. Consider ID theft: Some safety gurus suggest the following: Making a copy of your card and put the original in your safe. Then on the copy, black out the first five numbers of your Medicare ID, laminating the copy, and then put the original in your safe. This way you will still have the original if someone needs it, but won’t be carrying your social security number around in your wallet. Review your financial and health situation to see if you need a Medicare Supplement Plan or a Medicare Advantage plan. Not having a plan can subject you to unlimited costs if you wind up in the hospital or get sick. Sign up for the plan within the prescribed time period allowed. Review your situation to see if you need a Prescription Drug Plan, and sign up within the time period allowed to avoid a penalty. If you do not have coverage through an employer or Veteran’s plan, you may want to enroll, even if you do not currently take any drugs as the penalties add up fast. Review what your doctor has told you and take any steps to improve your health, if necessary. Enjoy your new plan! You’ve earned it! For more information or help navigating the ABCs of Medicare, call us at 866-445-6683 or contact us here.